Jake Saper, an investor with Emergence Capital, makes the case for investment in software and cloud tools for energy and natural resources. For the past century, innovation in energy, water and agriculture has been driven by massive capital expenditure (capex). Trillions of dollars have been poured into making drill bits better, irrigation systems cheaper, and solar panels more efficient. We’ve made tremendous progress in optimizing this hardware. But the software to take advantage of it has been relatively neglected. We’ve squeezed the value out of the atoms. It’s now time to focus on the bytes. Solar is a shining example. VCs have sunk billions into solar PV materials development. While this funding didn’t make (most of) these investors rich, it did contribute (along with Chinese manufacturing) to a staggering drop in hardware costs. In just the two-year period from 2010 to 2012, solar hardware costs plummeted over 45 percent. As a result, “soft costs” like permitting, financing, and customer acquisition costs now contribute 64 percent of the total installed costs in residential deployments. The best way to address such soft costs is with software. Indeed, software has successfully tackled these issues in other industries, such as Big Pharma, that have similarly high customer acquisition costs. There is a tremendous opportunity to apply enterprise software expertise to the natural resources space. Cost reductions from an industry-specific CRM could transform the solar market, expanding the addressable market by millions of homes. If solar developers could collect data about buildings (e.g., siting, roof orientation, power needs, permitting, etc.) and marry them with customer demographic data (e.g., income level, purchasing history, etc. ), the companies could be twice as effective at closing the “right” customers, thereby dramatically reducing customer acquisition costs. This opportunity is not limited to energy; the increasing pressure on agriculture and water resources means software solutions are no longer a "nice to have" but, increasingly, "do or die." Climate change is making what used to be “freak” weather events the “new normal.” Indeed, prolonged, severe droughts on every continent are driving up food prices and increasing the risk of economic destabilization for many communities. Yet experts estimate that 2.1 trillion gallons of water get wasted each year because of leaky pipes, faulty meters, and other undetected problems. In the U.S., around 10 percent of homes have leaks that waste 90 gallons or more a day. Sensor-based data coupled with smart software can give municipal water agencies and consumers a way to pinpoint losses and take remedial or preventative action. They aren’t taking action right now because they don’t know where to start. The food supply chain isn’t much better. An estimated 30 percent to 50 percent of food produced for human consumption never makes it to our stomachs due to premature spoilage and other factors that can be ameliorated through better monitoring and management software. Tremendous progress has been made in sensor technology over the past decade thanks to Moore’s law-like cycles and advances in low-cost wireless. Sensors on tractors can combine with software to tell farmers what to plant where. Sensors on drones can combine with software to tell utilities about potential issues along utility lines. And sensors in refineries can combine with software to tell operators what pipe is likely to break before it does (who can then deploy teams to prevent such disasters). But without software to make sense of it, the big data generated from these sensors is just dumb data. Given the focus on hardware spend to date, the software side of the natural resources space is relatively immature and ripe for opportunity. From a return-on-investment (ROI) standpoint, these software investments can generate much more value than hardware. 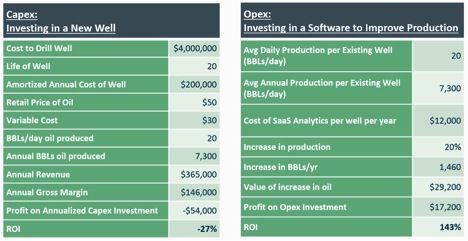 For example, if an oil company wanted to increase production, it could either invest in a new well (capex) or invest in software using big data algorithms to optimize its current output (opex). At current oil prices, many new wells are uneconomic to drill. However, using software to boost production on existing wells can be highly profitable even at low oil prices. Even at higher oil prices which render new drilling profitable, production improvements using software will almost always have a higher ROI than hardware investments. 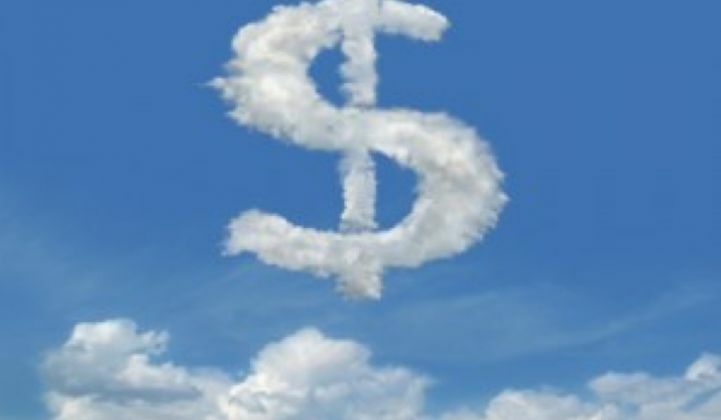 It’s important to note, however, that even though the software ROI is compelling, successful natural resources companies will start with small cloud deployments and lots of testing. You wouldn’t want your electric utility to adopt Facebook’s mantra of “move fast and break things,” because it’s a potential recipe for blackouts. Reliability, quality of service, and safety are, and always will be, paramount concerns in natural resources. But the space can no longer afford to ignore the benefits cloud software has brought to other sectors. 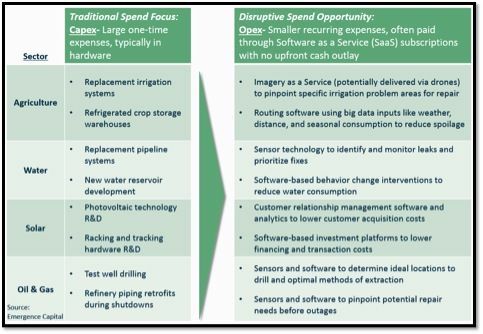 It’s time to shift that budget to opex, funding the cloud software innovations that will enable natural resources companies to optimize output in an increasingly resource-constrained world. Jake Saper is an investor with Emergence Capital and leads the firm’s Natural Resources Cloud practice. Prior to joining Emergence, Jake worked in Kleiner Perkins’ Green Growth Fund, where he sourced and led diligence on companies in the geospatial, agricultural tech, and enterprise SaaS sectors.